Mary-Kate and Ashley Olsen's Elizabeth and James brand will launch two fragrances for women, Nirvana Amethyst and Nirvana French Grey. Nirvana Amethyst ~ Spicy. "Elizabeth and James Nirvana Amethyst is an intriguing sentiment of decadent luxury. Infused with layered depth, the sensuous scent exudes a sophisticated combination of sweet honeysuckle mingled with the darker pleasures of refined tobacco, and is grounded by a touch of spicy cedarwood. This fragrance is effortless seduction in a bottle." Nirvana French Grey ~ Fresh floral. "Elizabeth and James Nirvana French Grey is a chic and mesmerizing fresh floral with an aphrodisiac allure. Notes of honeyed neroli mingle with wisps of clean lavender, then slowly melt into a sensual musk for a truly unforgettable fragrance. This fragrance is a weekend getaway to Paris in a bottle. " Elizabeth and James Nirvana Amethyst and Nirvana French Grey are coming soon to Sephora, in 30 and 50 ml Eau de Parfum and in a travel-sized rollerball. I have not been able to connect with this line, but will certainly give these a try when I see them. I haven’t spend much time with the second duo, but I did like Black. I Love Black. The only scent I can tolerate violets in. They both sound potentially pretty great. I haven’t found anything FB-worthy among the E&Js launched so far but really like Nirvana Black. Oh I love the purple! 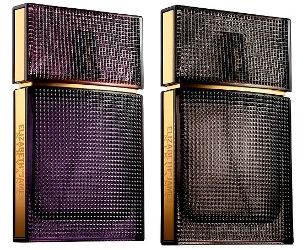 I think we’re owe for 2 on Amethyst perfumes though (Armani and Bulgari). This sounds nice though. Holy cow – this made my Monday. I am such a fangirl for the E&J line and really liked all but White of the first four (I liked that one, but peony isn’t my thing). I’m a little worried about the cedarwood in Amethyst (love actual cedar, but some of the synth ones are nose kryptonite to me), and I do wonder/worry if the sensual musk will be a laundry musk (also really not my thing)…but I’m cautiously optimistic! The only E&J bottle I have bought is Black. I do like Bourbon and Rose and have them in rollerballs. I will seek these new ones out for sure. Loved Rose, will definitely be keeping an eye out for these. Ooh, these look fun! E&J did pretty well with Rose and Bourbon, I’m looking forward to Amethyst. I love how they are keeping the bottle design throughout the range. I really like both Black and Rose, and am rather curious now about the Amethyst. Will have to check these out.